Asian Disaster Reduction Center (ADRC) attended the meeting of the Sentinel Asia Steering Committee held in Thailand, on 29-30 January 2019. 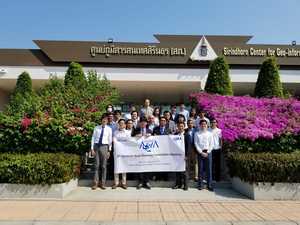 The meeting was also attended by JAXA, which serves as the secretariat of the Sentinel Asia Joint Project Team, other space agencies in Asia working, and image analysis organizations, and ADRC participated to facilitate connections between these organizations. Opening remarks by Mr. Koji Suzuki who is the Executive Director of ADRC. These were followed by a briefing by JAXA on the Steering Committee Mandate and status and lessons learned from emergency observations conducted thus far. All of these help demonstrate the advantages of satellite imagery for DRR purposes. Space agencies and research organizations reported on DAN activities. And it was focused on a basic approach for discussing the strategic plan which will be discussed throughout the year in preparation for the Asia-Pacific Regional Space Agency Forum (APRSAF), scheduled for the fall of 2020.